One activity during the 2005 AZ Quilt Retreat was the opportunity to participate in a mystery quilt. We knew ahead of time the number of fabrics we needed, the values of colors needed and how much of each value. What we didn't know - and wouldn't know until we got the clues - was what it looked like. 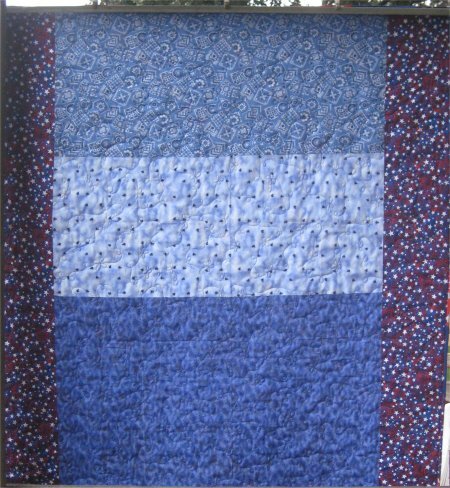 The mystery quilt pattern is "On the Road Again" and was designed as a mystery pattern by Debbie Caffrey for her second trip to The Road to California Conference in 2001. It was very interesting to see everyone's interpretation since all of our color choices varied so widely. It wasn't until now, in 2008 when I really started using my Tin Lizzie, that this top got quilted. 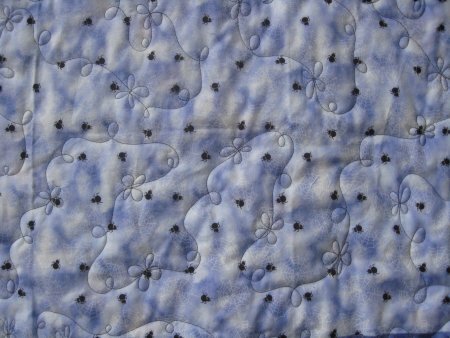 Given my dismal past performances with attempting pantographs and following marked quilt designs, I decided this time to do a free motion all-over meandering motif of loops and interspersed flowers, but you can see it better on the back. For the backing, I used up the remainder of the focus fabrics but still came up short, not only in length but in width. I dug through my stash and came up with a blue bandana print and a red-white-blue swirly print, which resulted in a big color-blocked backing. Because I didn't have enough of any of the featured fabrics to make the amount of binding that I needed, I made a strip set of the red Hershey Kiss fabric, a solid blue and a swirly red-white-blue print and made the binding from that. 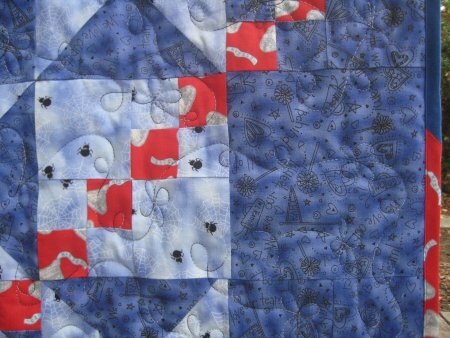 Although the red-white-blue print wasn't used on the front of the quilt itself, all the colors are there, so it coordinates nicely. I really do like making binding from strip sets, as the diagonal stripes of the binding adds just a little bit more "oomph" to the quilt. I am much, MUCH happier with this quilting than past efforts, mostly because ... you just can't go wrong with it. :-) You just keep making some loops and occasionally throw in some flowers.